Who knows what Sigismondo Malatesta, the famous 15th Century Lord of Rimini (and original ‘renaissance man’, as described by American poet Ezra Pound), would make of his city were he to return today. Apart from the obvious differences between the renaissance city (many significant parts of which remain, for example Malatesta’s castle) and that of the 21st – i.e the presence of skyscrapers, electrically powered street lights, and the ever present motor vehicle – one thing would perhaps strike him above all, the move to the seaside. In Malatesta’s time the city and its defences were decidedly inland, running around what is considered the centro storico today. Malatesta, on coming to power, embarked on a huge building programme, which included the famous Tempio Malatesta – the first, and one of the finest examples of neo-classical architecture in Europe – and his huge, and at the time thoroughly modern fortress, the rocca malatesta. His city, though, was built primarily on top of the existing city’s site – that is to say on the site of the Roman city of Ariminum, founded in approximately 286 B.C. Existing roman monuments, including the famous Ponte di Tiberio and Arco d’Augusto (which remain impressive monuments today) were incorporated into his city, all of which – even given the retreat of the sea over the centuries, were inland from the beach. Strolling around today’s city, Malatesta would find, at least during the summer months, a gravitational pull towards the expansive sandy beaches that would probably puzzle him. In his day the notion of lying on the beach for the day, with an occasional swim to cool off, would have seemed particularly strange, if not downright dangerous. The beach was a place for brigandry and smuggling, away from the protection of the city’s defences. Let’s not forget, as well, that in Malatesta’s time cities like Rimini were often at war with neighbouring city states. Throughout his lifetime Malatesta was in continuous conflict with powers like his neighbour Fedrico da Montefeltro, Lord of Urbino, or indeed the Pope (Pius II, for example, excommunicated Sigismondo in 1460 declaring him a heretic). Sunbathing and sea bathing would not, perhaps, have been high on the average citizens’s priorities at the time. So when did Rimini start to change, to become a town that is, for Italians (and increasingly tourists from around the world), synonymous with sun, sea, and sand? Professor Feruccio Farina, of the University of Urbino, in his fascinating study of the history of seabathing in Rimini – Una costa lunga due secoli (Panozzo Editore) – gives us a portrait of one of the first foreign tourist bathers to dip her toes into Rimini’s gentle waves. Her name was Elisabeth Kenny, and she was the young Irish wife of a Roman noble. She’s recorded as having visited Rimini in August of 1790 (over 300 years after the death of our Sigismondo), and stayed for over two weeks to benefit from the sea waves and air. It’s, perhaps, not surprising that Farina’s bather was an Irish woman, as sea-bathing became intensely popular in the British Isles during the 18th Century. As early as 1707 physicians like William Buchan were advocating sea-bathing for health reasons, believing in curative properties of sea water. In 1750 the famous Dr Richard Russell published his treatise Glandular Diseases, or a Dissertation on the Use of Sea Water in the Affections of the Glands, advocating both bathing in and the drinking of seawater. Seaside resorts sprang up around the english coast as the practice of taking the waters became a fashion craze. A year before Elisabeth Kenny’s visit to Rimini, for example, the nervous King George III famously went to the seaside resort of Weymouth, on the advice of his doctors. It was also during the late 18th century that both the bathing costume and the bathing machine (a roofed and walled wooden cart, allowing women to arrive in the water without offending Victorian notions of decency) were designed. This is not to suggest, though, that Rimini at the end of the 18th Century was a Mecca for Italian bathers. Far from it, as Farina points out, the city was not particularly famous either for its beaches or bathing facilities at this time. Kenny’s visit to Rimini was more down to convenience, travelling as she was to nearby Cesena. Rimini’s fame as a seaside town started closer to the end of the 19th century, with the opening of the famous Kursaal (cure room in German), a giant neo-classical structure designed by Gaetano Urbani cost the City over One million lire to build. It was inaugurated in 1873, and became, along with later the Grand Hotel (built in 1908), a potent symbol of a new type of tourism that would revive the city’s economy – as in truth, since the days of Sigismondo Malatesta, Rimini had been in a steady decline. Between the latter 19th Century and the first half of the Twentieth Century, Rimini started transforming itself into the ideal tourist resort. A perfect place to spend the hot months of the Italian summer (before air conditioning made staying in hot & humid cities like Bologna practicable). The second world war, though would change the nature of Rimini’s tourism. By the winter of 1944 Allied Troops had been bogged down in their advance, and occupying German troops established the infamous Gothic line just south of Rimini (dotted around the hills of Rimini are allied war cemeteries, testament to the fierce fighting that took place to liberate the town). Rimini with its port and railway was strategically bombed heavily by the allies, destroying much of the historic town during the final months of the Italian campaign. In April 1945 Italian partisans rebelled against the German occupying troops, paving the way for the final allied advance northwards, and Rimini entered into a new era. In 1948, the town’s first left-wing council took a dramatic step and ordered the demolition of the Kursaal structure – a symbolic break with the bourgeouis past of Rimini’s tourism, and a move much lamented nowadays where one must look at grainy black and white photos to get a glimpse of the famous building. Whether the Kursaal would have fitted into post-war Rimini’s seafront is debatable, though, as Rimini rebuilt itself both in terms of its buildings and image. The 1950s and 60s saw the Italian economic miracle take place, with booming production from the factories of the North, and the rise in demand for good-value holidays. Rimini, perhaps more than any other Italian resort town, rose to the challenge. At the same time that Federico Fellini, Rimini’s most famous modern son, was recreating the city of his youth in films like the Oscar winning Amarcord, the actual city was building up a tourist infrastructure that would bring families to the riviera, lured by well kept beaches (the seafront was divided up and licenced out to beach operators charged with keeping the beach clean and pristine, in return for the right to charge for beach loungers and umbrellas), affordable accommodation, and some of the best food in Italy. 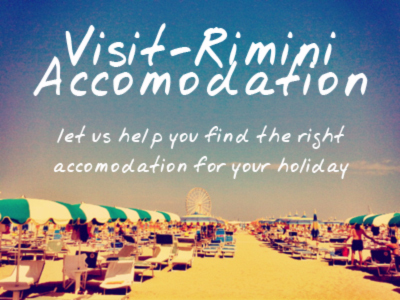 Over a period of 30 years Rimini established itself as the place to holiday for Italians. It’s been estimated that over half of the Italian population has visited Rimini at least once (La Repubblica -21st March 2007). Ironically though, were Sigismondo Malatesta to stroll around the Riviera today,, he’d find the stirrings of a gravitational pull back towards his own buildings, and the historic city centre. There’s a renewed interest both amongst tourists and experts in Malatesta’s Rimini – a high profile conference was held, for example, last year in Los Angeles. At the same time the wealth of events and festivals held each summer, ranging from street theatre and wine tasting, through to open air cinema and fashion shows, have introduced many to the charms of the old town of Rimini. What makes Rimini a good holiday destination (easily reachable by direct flights from around Europe), is that one doesn’t have to choose between the classic beach holiday or culture. In Rimini they exist side by side, separated by a few kilometres. You can sun yourself during the day, perhaps lunching on a plate of fresh fish and piadina (the delicious local flat bread), while in the evening taking in a classical concert in the Renaissance castle, followed by a dinner of wild boar and a glass of Sangiovese wine. Describing Rimini, rock star and film-director Luciano Ligabue (who set his remarkable film Da Zero a Dieci in Rimini) remarked that this riviera town ‘is like the blues. It has everything in it’. It’s hard to disagree.